It's easy to be cynical about what kids' sports aren't doing or aren't doing well enough. As regular readers of the blog know, it's a fairly lengthy list. 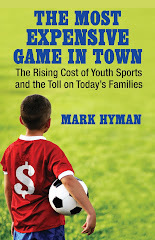 We ought not to lose sight of the force for change that youth sports can be. My friend Ken Shropshire passed along this short clip which highlights the work of several international aid groups that teach through sports - Grassroots Soccer, Peace Players and Partners of the Americas, among others. These groups and the inspiring people who run them take on big challenges like educating kids about HIV and promoting harmony among races. And it seems to be working. For one day, no talk here about overuse injuries and out-of-control parents. I too believe youth sports can be and should be a force for positive change and experience. Your links, insights and observations are very much welcome and provide this youth sports coach of 16 years inspiration and motivation to keep doing the right thing. Thanks.